That’s not how you win a playoff hockey game on the road, that’s for sure. And while there’s no doubt Gallant is right, that his team didn’t do much of anything well, it was specifically their deficiencies when they had the puck that sunk them in Game 1 in San Jose. There are three places a hockey team can possess the puck, in the defensive zone, in the neutral zone, and in the offensive zone. In all three, the Golden Knights failed. When they had the puck and needed to exit, they struggled. When they eventually did get the puck out, they couldn’t get it through the neutral zone with speed and crispness with any consistency. And in the cases where they did get it in, the forecheck came up lame. Here’s the problem, according to the Golden Knights (and one Shark that we asked), nothing really changed in the way San Jose defended against Vegas. Normally against the Sharks, Vegas exits well, flies through the neutral zone, and forechecks the Sharks into oblivion. Tonight, that was not the case, yet they got what they expected. So the problem must have come from within. In the end, it’s essentially chalked up to the Golden Knights looking in the mirror and saying they weren’t good enough. All the lines made bad decisions and passes in their D zone. The 1st line has a bad habit of trying to force cross ice passes at the offensive blue line. SJ’s D know they’re going to try it and are waiting to pick it off. If the pass isn’t there dump the puck. The 2nd line is slow. The SJ’s D has no fear that anyone on the 2nd line is going to blow by them. This is allowing their D to close the gap and giving the 2nd line zero time and space. By putting Pirri on that line SJ’s D will have to respect his speed and back off. This will give Stone and Stastny more room. Pirri also gives that line a speedy winger to make a outlet pass to. Putting Pacioretty on the 3rd line makes it a real threat. They were great together earlier in the season. I think this line has the ability to be as good or better than the HBK line that won Pitt the 2016 cup. Either Nosek or Carpenter will have to play on the 4th line to be the 6th pker. Its so rare for me to read a comment to an article and agree with everything in it. I think Bent Hermit nailed it here. 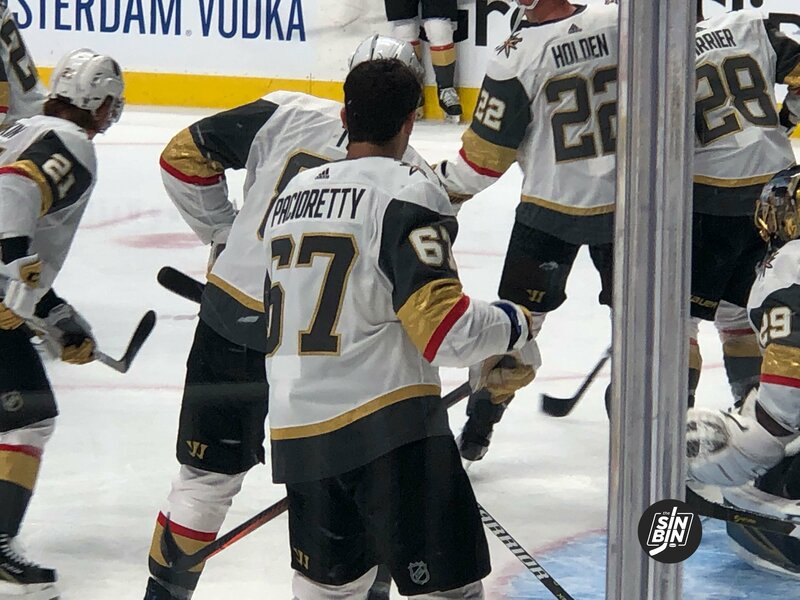 Unpopular opinion: Pacioretty slows things down on the second line and his power play unit. It’s a detriment to both. We had several games like this down the stretch where we were horrible with puck management. We chalked it up to meaningless games and lack of focus. I’m a little worried now that it might be a bigger problem than we thought?